One of the most successful illustrators of all time, Newell Convers Wyeth studied under Howard Pyle between 1902-1904 in Chadds Ford. Perhaps more than any other student, he took Pyle’s dictates completely to heart. He was the pre-eminent example of the results of Pyle’s teachings by following every precept, religiously. During his career, Wyeth painted nearly four-thousand illustrations for the Saturday Evening Post, and many other magazines and books. An early aficionado of Pyle’s he became his greatest advocate even settling his family in the Brandywine area and in Maine, where Wyeth’s still live today. Much of N.C. Wyeth’s art embraced an American Western theme, filled with cowboys and Indians, gun fighters and gold miners. He also illustrated popular kid’s books topped off with pirates, knights, and brigands in novels entitled Treasure Island and Tom Sawyer – which established visual images of the characters in young readers minds eye, for generations. Amongst all his illustration plaudits, N.C. Wyeth is famous for being the father of artist Andrew Wyeth and the grandfather of artist Jamie Wyeth–having founded a patrimony of major consequence American art history-a dynasty of celebrated artists. N.C. sold his first illustration to the Post in 1903, at twenty-one years of age, and his first book commission was accepted in 1911, illustrating Treasure Island for the noted publisher, Charles Scribner. So well received was his first book, that he went on to illustrate a whole range of beloved ‘boys adventure books’ which came to be known as Scribner’s Classics, including Kidnapped, Robin Hood, Robinson Crusoe, The Boy’s King Arthur, and The Last of the Mohicans, and twenty other titles. The Scribner’s Classics have never waned in popularity and many are still in print today. Wyeth’s valiant and heroic-type characters, created prototypes of American heroes, which have lasted and set the standard for movie, television, and computer game heroes. Many of our real life heroes are modeled on those first envisaged by NC Wyeth as most boys see themselves in roles of an heroic nature and act accordingly when the occasion arises. The public seems to crave the singularly, dignified yet casual images which they learned as children from looking at pictures in books illustrated by this master. Steven Spielberg and George Lucas grew up with these images and Indiana Jones could well have come directly from a Scribner’s Classic, as first envisaged and then painted by N.C. Wyeth. Born in Needham, Massachusetts, nearby Boston in 1882, Newell Convers Wyeth showed an early passion for drawing and was encouraged by his family. From 1903, until his tragic death in a 1945 car accident at a railroad crossing, N.C. Wyeth set new standards for illustrators, in styles, in technique, and through his imagination. He had an extraordinary ability to create living characters from an author’s imaginary story. Because of his fantastical imagination, he envisaged all aspects of a story, often times identifying crucial elements often overlooked by the author himself. Cooper, DeFoe, Irving, Stevenson, and Verne were some of the authors whose works he illustrated. As a youth, he was enrolled by his parents in the Massachusetts Normal Arts School with further study at the Eric Pape School of Art. In 1901, N.C. was in Annisquam, Gloucester, Massachusetts, attending private classes taught by George L. Noyes, a landscape artist. He got two things from Noyes’ class, 1). a love of nature and plein aire painting, and 2). A new friend in Clifford Ashley who had just been accepted into Howard Pyle’s new art school in Wilmington. 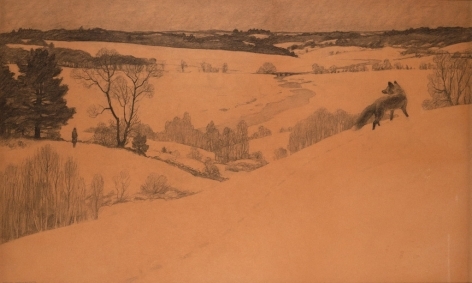 Ashley suggested that Wyeth should try to enroll and join him in Delaware to study with the famous, Howard Pyle. 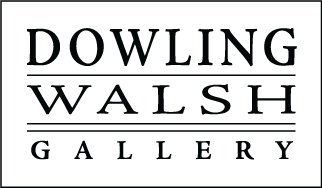 Recognized as the foremost illustrator, students, were able to view his work in almost every national magazine, and he was worshiped by young aspiring artists. Pyle, on the other hand, now wished to pass along his knowledge to the best young artists proselytizing them as illustrators. 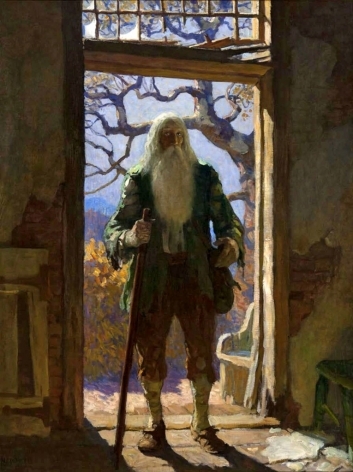 N.C. Wyeth arrived in Wilmington on his twentieth birthday and met Howard Pyle for the first time. Some have said that Pyle’s greatest contribution to his students other than teaching and providing inspiration, were his many contacts with publishers and art directors. He quite often secured commissions and staff positions for his students. Pyle exhorted his students to “jump into their paintings to know the place” they were depicting. To go and experience the environments, and Wyeth took him literally, and went out West and lived with the Utes and Navahos. For three months he punched cattle, herded, was a mail-carrier, and documented his experiences in meticulous drawings. When he returned his incredible artwork was sought after and published at an astonishing rate. N.C. Wyeth married in 1906, moved to Chadds Ford and continued to illustrate books and magazines, advertisements, and mural commissions, and that which he cherished most, the rural American scene. Wyeth also illustrated a number of books for Cosmopolitan Book Corporation, Houghton Mifflin Company, Little Brown and Company, David McKay Company, and Harper and Brothers. Notable among them were the Mysterious Stranger (1916), Robin Hood (1917), Robinson Crusoe (1920), Rip Van Winkle (1921) and The White Company (1922). Wyeth found it financially lucrative to accept commercial work in the form of advertisements, calendars and posters. The range and the quality of these advertisements vary from the elementary Lucky Strike and Coca-Cola series to the beautiful paintings of Beethoven, Wagner and Liszt for Steinway & Sons. For years, Wyeth looked upon illustration as a financial means of support for his family but wanted most of all to be recognized as a fine artist. In the 1930′s, N.C. Wyeth was accepting fewer illustration and advertising commissions and devoted more time to easel painting of landscapes.